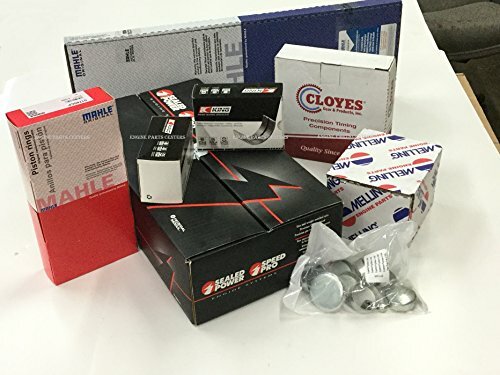 This listing is for an engine Re-ring kit with (4) dish Top pistons for Chevrolet GM Mercrusiser marine 3.0L 181ci L-4 standard rotation engines with a 1-piece rear seal. These engines are commonly used in Mercury Marine, OMC, and various other marine applications. This kit comes with rod bearing width of .842) Some late models use a .713 wide. 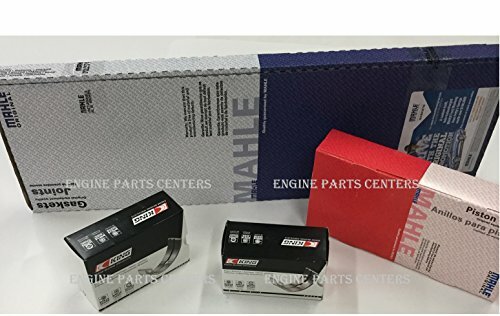 Please determine rod bearing with before ordering.This kit contains the following top quality parts: Piston Ring Set, Rod (need to know if rod bearing width is .713 or .842) & Main Bearing Sets, Marine Engine Gasket Set & (4) Pistons --Please specify piston head type (dish or flat top) We offer Oversize Pistons (Available in .020", .030" .040 & .060"), Rings, Rods and Mains at no extra cost. IF OVER SIZES ARE NEEDED, PLEASE MESSAGE US WITH THE BORE SIZE AND BEARING SIZES YOU NEED TO VERIFY BEFORE ORDERING, OTHERWISE YOUR KIT WILL SHIP WITH ALL STANDARD SIZES. This listing is for an engine re-ring kit for 1987-1996 Chevrolet GMC trucks with the 350ci (5.7L) V-8 VIN-K engine. "K" being the 8th digit in vehicle VIN Plate. Includes: Cast Piston Ring Set , complete overhaul gasket set - (can be Victor or Fel Pro) Rod Bearing Set Main Bearing Set. This is a Standard/Stock Size Kit. We offer Oversize , Rings, Rods and Mains at no extra cost. PLEASE EMAIL US THE BORE SIZE AND BEARING SIZES YOU NEED WITH YOUR ORDER, OTHERWISE YOUR. KIT WILL SHIP WITH ALL STANDARD SIZES. 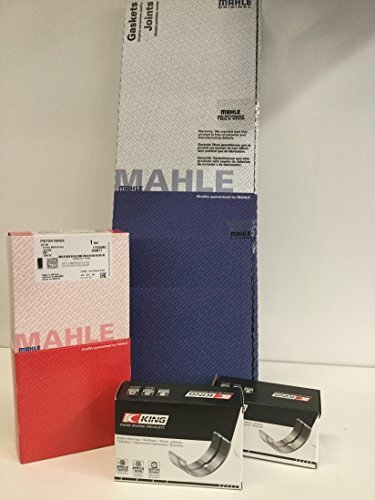 Kit Containing: Piston Ring Set, Rod Bearing Set, Engine Gasket Set, Main Bearing Set, Cam Bearing Set, Timing Chain and Sprocket Set; 3-pieces, Timing Chain Damper, Oil Pump Assembly, Hypereutectic Piston Set (6), Freeze/Expansion Plug Kit..This is a Standard/Stock Size Kit. Oversize Pistons, Rings, Rods and Mains are available at no extra cost. Please email or call to check availability with specific sizes needed or otherwise your kit will ship with Standard Sizes. This listing is for a Premium engine rering kit for 1985-'95 Toyota Truck, Celica, and 4Runner 22R RE REC. Kit Includes: NPR Piston Rings, King Engine Rod & Main Bearings and EristicFULL Gasket set. 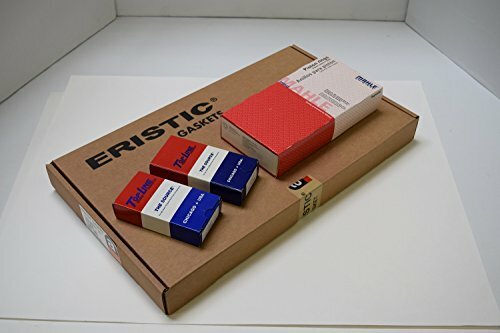 ALL NEW IN BOXES - ALL TOPLINE // ERISTIC // NPR - PREMIUM O.E. SUPPLIERS TO THE AFTERMARKET. This is a Standard/Stock Size Kit. Oversize Pistons, Rings, Rods and Mains are available at no extra cost. Please email or call with specific sizes needed for your engine or otherwise your kit will ship with Standard Sizes. Guardian Engine re-ring kit for Marine 181 2pc crank seal standard rotation engine THRU ENGINE SER #6229717. 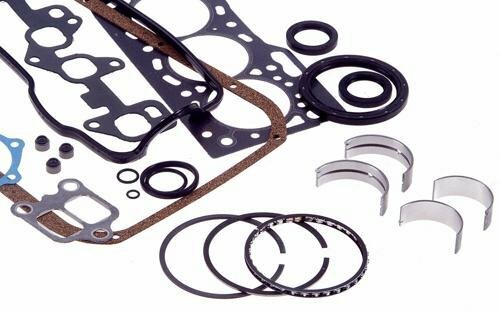 Consisting of a full gasket set, rod bearings, main bearings and rings. This is a Standard/Stock Size Kit. Oversize Rings, Rods and Mains are available at no extra cost. Please email or call with specific sizes needed or otherwise your kit will ship with Standard Sizes. 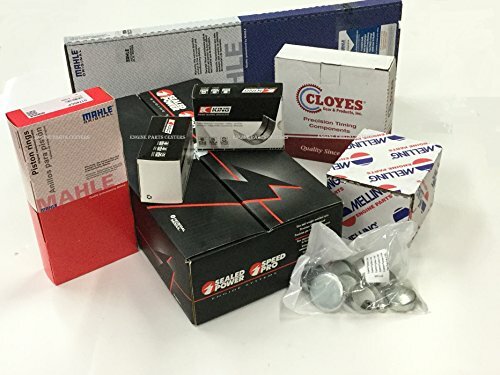 This listing is for a Guardian engine rebuild kit with the Sealed Power Hypereutectic H631CP Flat Top 2V Relief piston & MOLY Rings upgrade for 1967-79 Chevrolet 350ci (5.7L) small block V-8 engines. Kit Includes Victor Gaskets, Perfect Circle moly rings, King Bearings, Sealed Power HYPEREUTECTIC Pistons and Melling Oil Pump. Kit includes: : Cast Piston Ring Set, Rod Bearing Set,Main Bearing Set, Cam Bearing Set, Oil Pump, (8) pistons and Freeze/Expansion Plug Kit, Piston & Ring Sizes(4.000", 4.030", 4.040", 4.060") Main Bearing Sizes(STD, .010", .020", .030") Rod Bearing Sizes (STD, .010", .020", .030"). 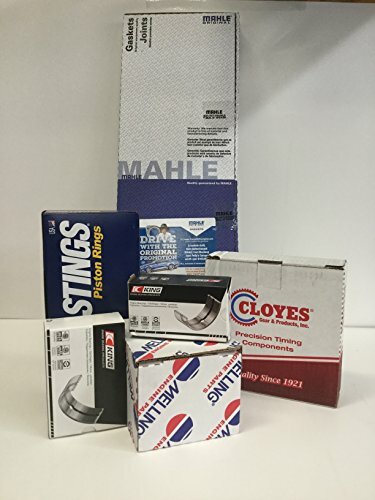 PARTS # 1-300H + w/40564CP + w/H631CP This is a Standard/Stock Size Kit. We offer Oversize Pistons, Rings, Rods and Mains at no extra cost. PLEASE EMAIL US THE BORE SIZE AND BEARING SIZES YOU NEED WITH YOUR ORDER, OTHERWISE YOUR KIT WILL SHIP WITH ALL STANDARD SIZES. 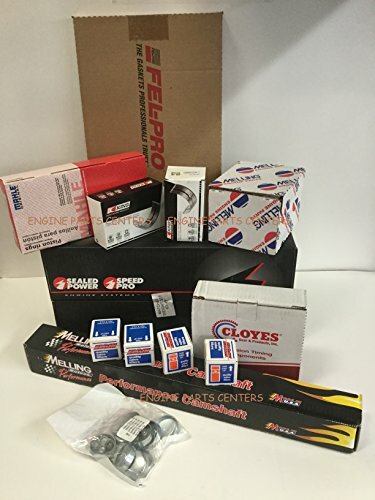 This listing is for a Falcon premium master engine rebuild kit with the torque/RV camshaft upgrade for 1969-79 Chevrolet 350ci (5.7L) small block V-8 engines. P/N 1-500+306-400. Kit includes the following premium components: Cast Piston Ring Set - SPECIFY SIZE Rod Bearing Set - SPECIFY SIZE Main Bearing Set - SPECIFY SIZE Cam Bearing Set FEL-PRO Full Engine Gasket Set Timing Chain and Sprocket Set (3-piece) Oil Pump Cast Flat Top Piston Set - flat head w/4 valve reliefs - SPECIFY SIZE Freeze/Expansion Plug Kit Torque/RV Camshaft (cam specifications below) Valve Lifter Set (16). This is a Standard/Stock Size Kit. Oversize Pistons, Rings, Rods and Mains are available at no extra cost. Please email or call with specific sizes needed or otherwise your kit will ship with Standard Sizes. Camshaft is Good low end torque & pulling power. Smooth idle. Int/Exh Valve Lift .420/.443 Advertised Duration Int/Exh .278/.288 Duration at .050" Int/Exh .204/.214. Looking for more Engine Kit Rings Bearings similar ideas? Try to explore these searches: Winter Hat Scarf, Fish Bath Gel, and Single Cupcake Box.